Sometimes I let my party posts go for months and months, and sometimes I can’t wait to post them! Jack’s is ready to be blogged, so I thought I had better blog Ava’s from last year. HAHA. The reason I wasn’t chomping at the bit to blog it is because we had to have it inside and the pictures are not the best. I know, picture snob alert! 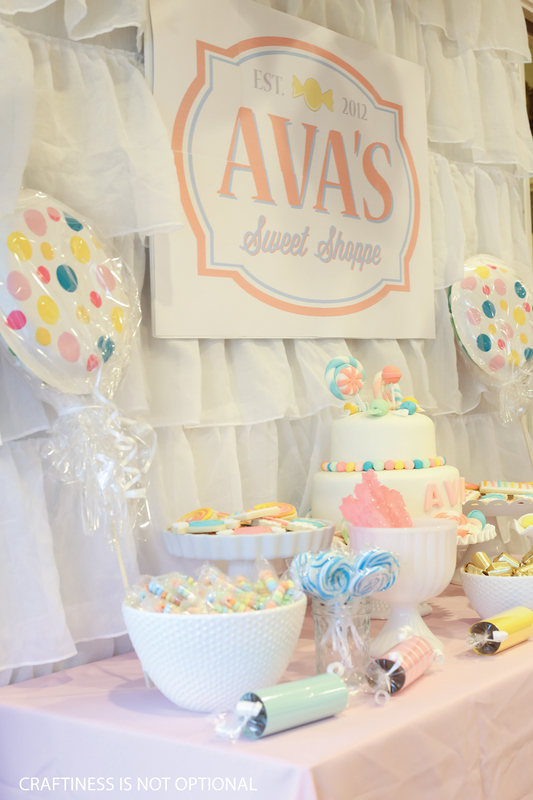 But I did the best I could do, and here is Ava’s Sweet Shoppe party! 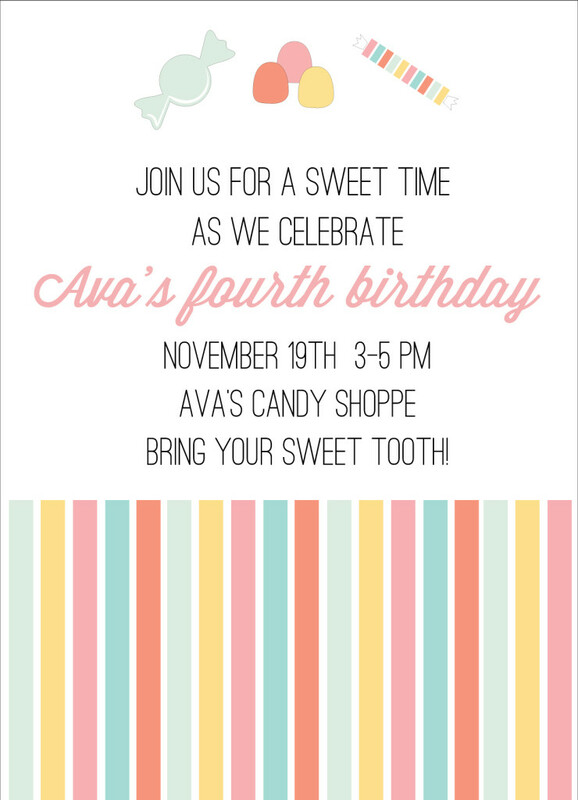 When we talked about the theme for her fourth birthday party, she was super fixated on a candy party. I kinda tried to talk her out of it, but she was SO STUBBORN about it. (I dunno where she gets it? 😉 So, a candy party it was! We picked bright fun colors and I worked up this invite! 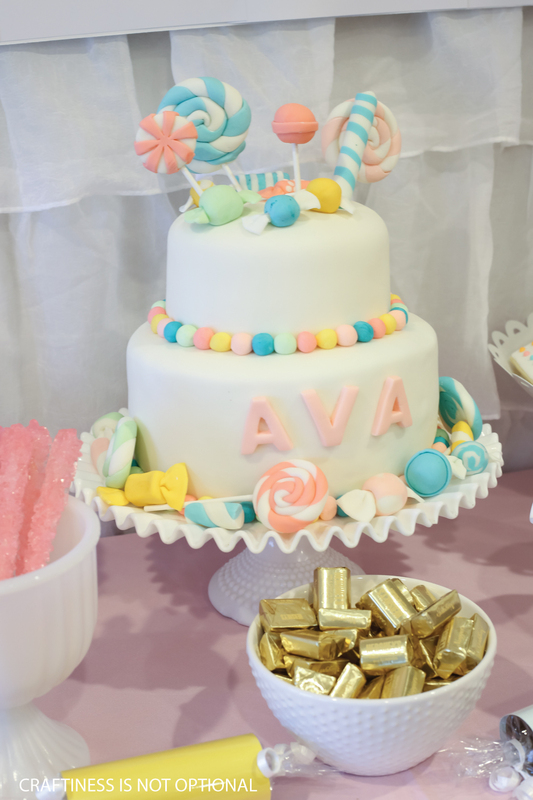 I wanted it to look so sweet it would hurt your teeth, so we had sweet pastels, golds, and white as the color scheme. I wrapped up honeycomb balls and paper lanterns in cellophane to look like candy, and hung them from the ceiling! I made the sign in illustrator and then printed it out, tiled, just on regular printer paper. You could kinda tell up close, but oh well! I basically just bought a ton of candy on Amazon for the treats, lol. 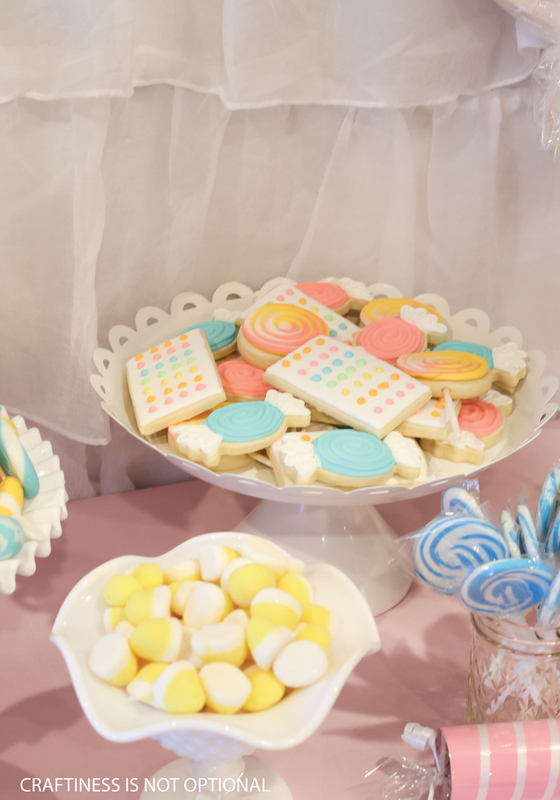 Candy bracelets, lollipops, sugar crystal sticks, lemon puffs, watermelon gummi rings…yum! I made her shirt with my silhouette and iron on vinyl the week before-it just made me crack up! 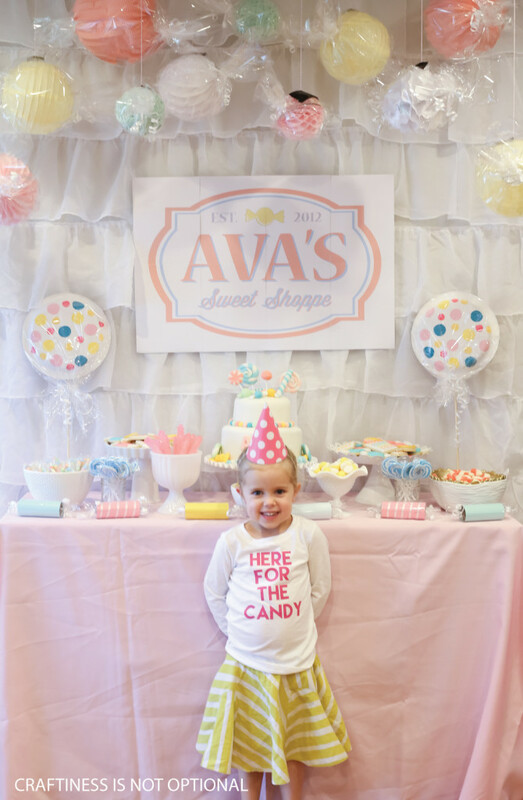 She’s always here for the candy, and she LOOOVED her party. It made her so happy. 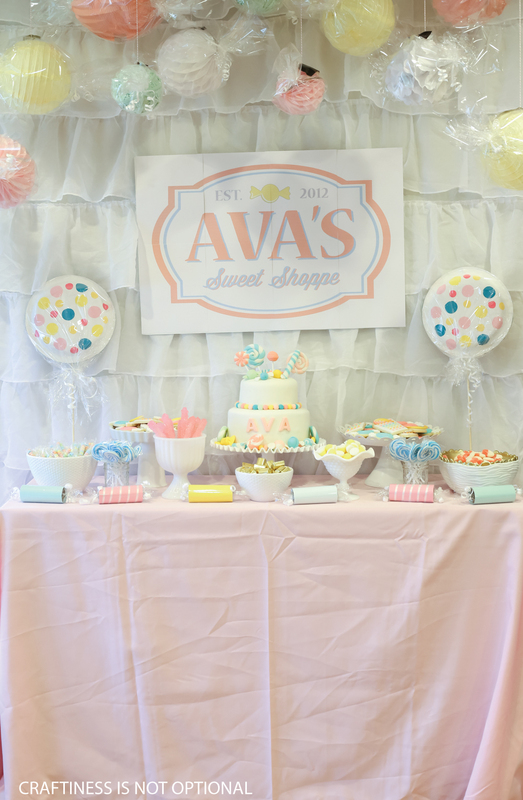 I wrapped some TP rolls in cardstock and cellophane to look like candy and decorated the front of the dessert table with them! I did make cookies and a cake! I love how the cookies turned out! Super simple too! My favorites are the candy dots! AHH! I also made some lollipops and had fun swirling the icing colors together! I had TOO much fun with the cake. 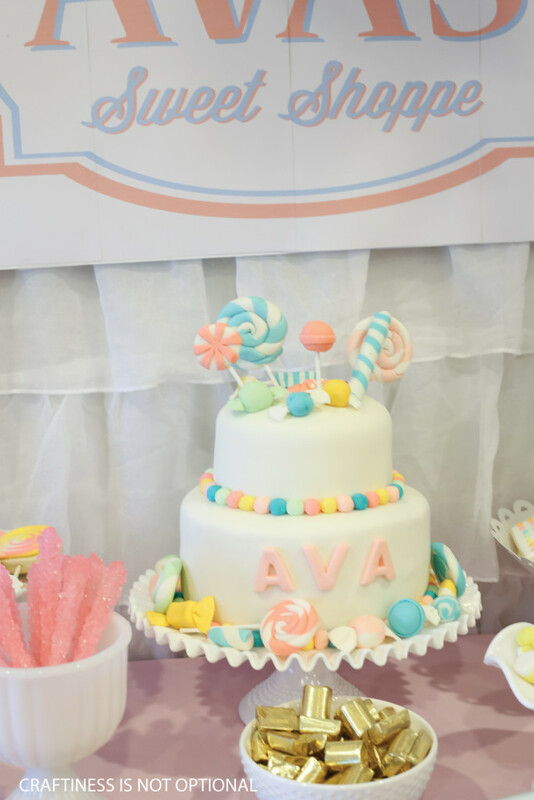 It was a two tiered chocolate cake with vanilla frosting, and covered in homemade marshmallow fondant. Then I went crazy with the fondant candy! I made lollipops, hard candies, candy sticks, tootsie pops, etc! I love how it’s a little over the top, covered in all that candy! I definitely used my fair share of powdered sugar for this party. makes my teeth hurt just thinking about it. I am blown away by your creations. Those cookies are so sweet, and the cake, well, let’s just say you did an amazing job. I thought the entire theme was beautiful. There are sure to be some wonderful memories from that day! Good job!! I love handmade everything. That is so cute! I love the lollipops on the sides of the table… are those made from paper plates and dowels? And that cake is really fun! Plus the colors are perfection. So cute. I love the cake, I love the colours. I like handmade. 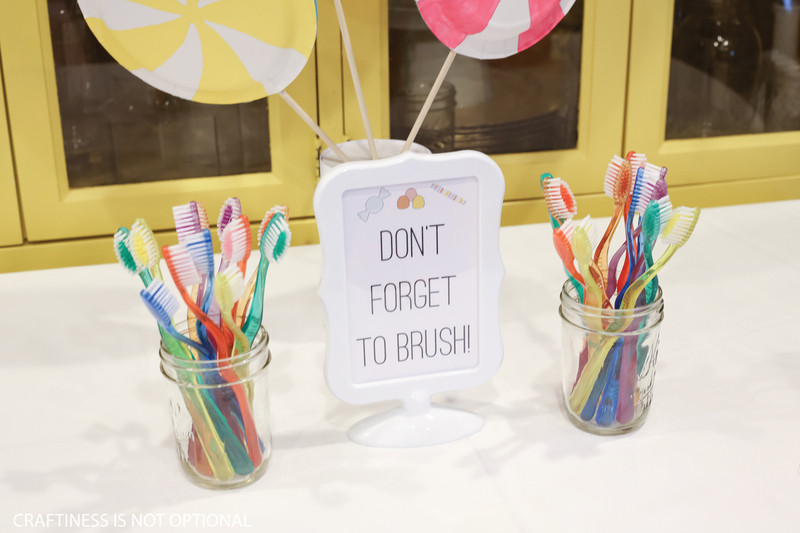 Oh, my gosh, those paper plate lollies are so cute. 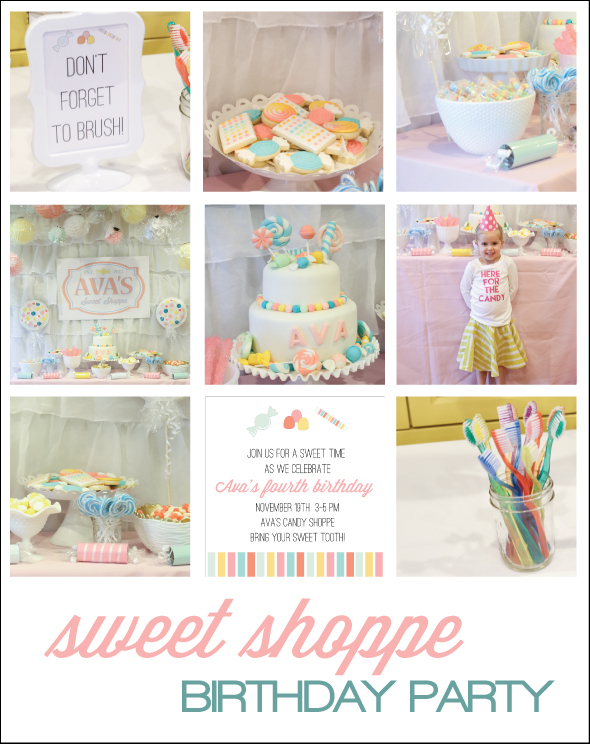 Amazing Sweet Shoppe Party! So cute! I am wondering about the white ruffle backdrop. Was this something you made or purchased? thank you! It was a ruffled shower curtain actually! They make great party backdrops!